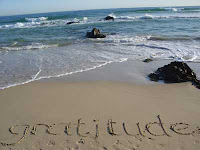 I wholeheartedly believe that being in a state of gratitude changes everything. However, I acknowledge that if life is rough for you right now, finding things to be grateful for can be difficult. I also know that you may actually just not want to be grateful right now. Being grateful does not deny the hardships you may be going through, it doesn't change the way things are and it doesn't blind you to the struggles of the world. Yet being grateful does change your mood and your general feeling about life. Being grateful also moves your ego out of the way, accepts who you are, how things are and where you are-helping you live in this very moment. When you move into gratitude, you open your heart, your awareness and your attitude to give thanks...and to receive them, to see inspiration, and to receive guidance and help. Being grateful, you may actually move forward from where you are stuck and find solutions to your problems. You don't have to start by blessing your bankruptcy, your layoff, your failed marriage, your illness and such. You can start by pushing yourself a little...fake being thankful until you make it. Start by giving thanks for your morning coffee, for good music on the radio, for the kind smile a stranger offered. Once you start experiencing a lift in your mood, you will grow your list.